To truly understand the quality of Riviera wheels, you have to combine elegance and impressive style, achieving a true sense of prestige. If you want to find the perfect wheels for your premium vehicle, such as the Range Rover, you have to get a set of alloys that can complement and uplift such a luxury machine – this is where the Riviera range of wheels excel with effortless class. 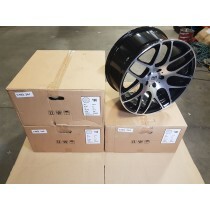 In a market where other wheels do not add any character or class to your vehicle, Riviera alloys boost your vehicle’s character immensely, turning even more heads!